Haven't posted a Swiss Centre picture for a while. It finished demolition some months ago, and has now entered the construction phase. There are two large blue cranes on site (you can see the bases of them in frame). Today's new arrival is the upright grey thing in between them. We're not quite sure what it is. They got it a certain amount of assembled and then seem to have taken it apart again, so presumably they are Doing It Wrong. The truck at the bottom has the remainder of it. We suspect it may be a concrete pourer - any ideas? 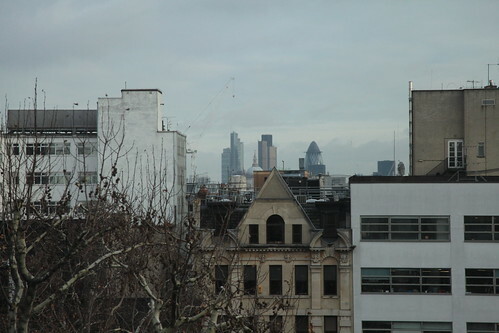 Because the building is now not there any more, and it's winter and some of the trees are out of the way, we've noticed we can see the Natwest Tower and the Gherkin from the top floor. 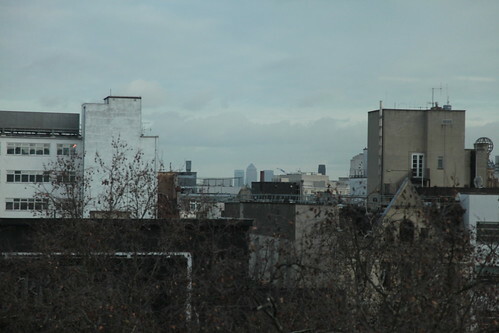 I managed to see quite a few more city towers from the roof but didn't stop to identify them. you'd think they'd have done it from the other end. big and noisy. biggest premiere I've seen in Leicester Square, I reckon. This afternoon, a giant dragon robot is eating the Swiss Centre. It apparently likes to chomp on steel-reinforced concrete. This is very exciting. It was furiously attacking the building all afternoon, causing severe vibration in our building on the opposite side of the road. It ate quite a lot. ...and what do you think is going on? the mystery of the mysterious light switch : CASE CLOSED! The other light switches aren't mysterious at all. This is what they do. So. I was thinking the other day, that it was funny that not only did I have a mysterious light switch that I didn't know what it did, and that I also had a light (on the cooker hood) that sometimes didn't turn on when I wanted to. I must have been very tired, because when I decided that these two facts might be related I thought it was a breakthrough! So I did an experiment. here is the cooker with the mysterious 3rd switch on! So. The mystery was solved : the mystery switch controls the light switch that the cooker light is on. Sorry for such a dull answer. Next week, we investigate what is up the mysterious hatches in the hall and the corridor outside! i have permission to put up curtain rails in the bedroom now. and the phone line should be installed on friday. i now have a proper old-fashioned coatstand! i looked all over leicester for this, before finally finding it in Habitat. And then carried it all the way to my flat (in the rain). Apparently I can collect my mailbox key from letting agency tomorrow. I also now have a licence to be brainwashed recieve television broadcasts. so will be taking my telly to flat and getting a freeview box and a splitter and an extension cable. bloody knackered. pub quiz tonight at the Marquis! If you know about sport or geography, please join our team. tomorrow should be a bit more of a quiet day, with Charli visiting the flat. Then Wednesday will be another Ikea trip, to buy shelves shelves shelves and possibly a sideboard. Update at 7pm: Now have temporary television (until we can be bothered to move the big one) and a reasonably inexpensive freeview PVR. I can rewind live TV! Wardrobe now done (apart from the handles), and good progress on bed. pictures of my flat, mostly taken today. Last night's snow has settled. Hi to the newly added people. With my dollar, Ez has bought me a bizarre green foam Statue of Liberty thing (It has spikes sort of like the statue, and a hole in the middle so I can put it round my head). Woo. And here are photos from the Dears last night, too. These photos start at the right hand side of the venue, near the Ladies, then I worked my way round sideways to the speakers on the left of the stage. The last photo is of the band just coming off stage. I can't be bothered to caption all these at the moment (and anyway I don't know who everyone is). The camera got rather screwed up so many of the distance shots were unusable. Unfortunately these included all ones of me! Other people also escaped photography somehow. I quite like the power that taking photographs in clubs gives me. Muhaha. I shall have to bring my camera next time I'm out, too!